Although I was early, my skepticism about the growth story of Crocs (CROX) turned out to be right on the money. 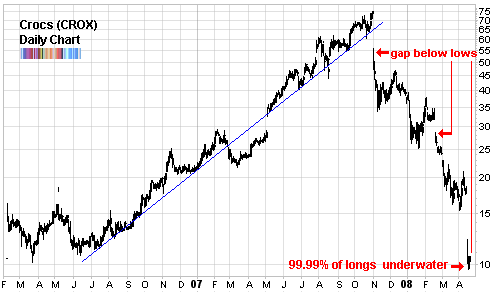 The dream turned into a nightmare for the longs with an almost 40% gap down on November 1st 2007. Although it would have been very painful, the best option - in hindsight - would have been to sell right there and then. That’s because when Wall St. turns on a one time growth darling… it can get very ugly. For one, no growth investor or swing trader wants to ride along with management when they were either blindsided by a slowdown or saw it coming and were coy and didn’t communicate it in advance. As well, declining sales/growth reduces the valuation of a company. And it has the levered effect of also reducing the multiple used to value it: the price earnings ratio. So the company is hit with a double whammy. Very few are able to recover from this. That’s why it is dangerous to fall in love with a stock, no matter how persuasive the arguments. A stock is a stock is a stock. Other than the obvious line break (blue) that spelled the end of the run, it is interesting that each gap down was below the previous swing low. What more obvious sign that buyers were simply not showing up? In other words, in each subsequent price realignment, it missed previously established support levels. Until finally, it is now trading below the first double bottom in 2006. It is safe to say almost all longs are now underwater and unhappy. Which means that if a miracle delivers a rally, they will be so relieved to be able to get out with any semblance of break even, it will be a short lived rally. Other than running away from former growth stock darlings, Crocs has other useful lessons. Study the first few months of CROX and notice how it built a base from which it launched a massive run. It almost looks like two back to back cup and handle formations. Now go and find stocks which have similar bases. IPOs are great candidates for growth but they are few and far in between these days. Are you referring to Shrub or the mountain? If you are an active trader or just a trader with a clue, then you’d have your stop in the after market hours, or exit immediately upon the price reaction in CROX on the earnings announcement day of their top. 40% gap open is not entirely true. You could have gotten out a lot earlier than the next morning if you aren’t a large institutional player. Joe, you may be right but for most people the opening bell marks the start of trading. Having said that I don’t even know for a fact if pre-market gave an opportunity to get out at a smaller loss. It may have been lower! It is impossible to say without going back to the data.